Alpaca Products Store Alpaca Furs, Alpaca Rugs, Alpaca Throws and Alpaca Stuffed Animals. High Quality Alpaca Fur Products. We offer a large range of alpaca products: rugs, cushions (pillows), bed covers and stuffed animals. We have over 120 patterns of alpaca rugs, alpaca cushions and alpaca bed covers in different sizes available in stock. In addition we can produce customized orders. The look and feel of luxury; purchase your alpaca products online now. Experience the exceptional warmth and unparalleled softness of one of the most luxurious fibers in the world. The warmest and softest of the alpaca fibers, baby alpaca is the first shearing of the alpaca from high in the Peruvian Andes. Luxurious 100% Hand Made Alpaca Teddy Bear. One of a kind stuffed toy. Made of soft alpaca fur. Best and most comfortable decorative home decor. 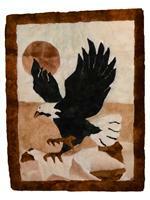 Luxurious 100% Hand Made Alpaca Rug. Circular design of a boat wheel, and perfect for any room or environment. Luxurious 100% Hand Made Alpaca Rug. Rectangular design of a Butterfly, and perfect for any room or environment. Luxurious 100% Hand Made Pillow Size Alpaca Rug. Animal design of a Butterfly. Has a zipper for stuffing and also can be used as an area rug. Luxurious 100% Hand Made Alpaca Rug. Rectangular animal design of a coyote, and perfect for any room or environment. Luxurious 100% Hand Made Alpaca Rug. Rectangular geometric design, and perfect for any room or environment. Luxurious 100% Hand Made Alpaca Rug. Rectangular animal design, and perfect for any room or environment. Luxurious 100% Hand Made Alpaca Rug. Circular geometric design, and perfect for any room or environment.